Tom Perkins Black shells puttenesca. Mon–Wed. 7 a.m.-11 a.m., 11:30 a.m.-3 p.m., 5 p.m.-11 p.m., Thurs, Fri. 7 a.m.-11 a.m., 11:30 a.m.-3 p.m., 5 p.m.-11:30 p.m., Sat. 7 a.m. to 3 p.m., 5 p.m.-11:30 p.m., Sun 7 a.m. to 3 p.m., 5 p.m.-10 p.m.
San Morello is a difficult one to review. 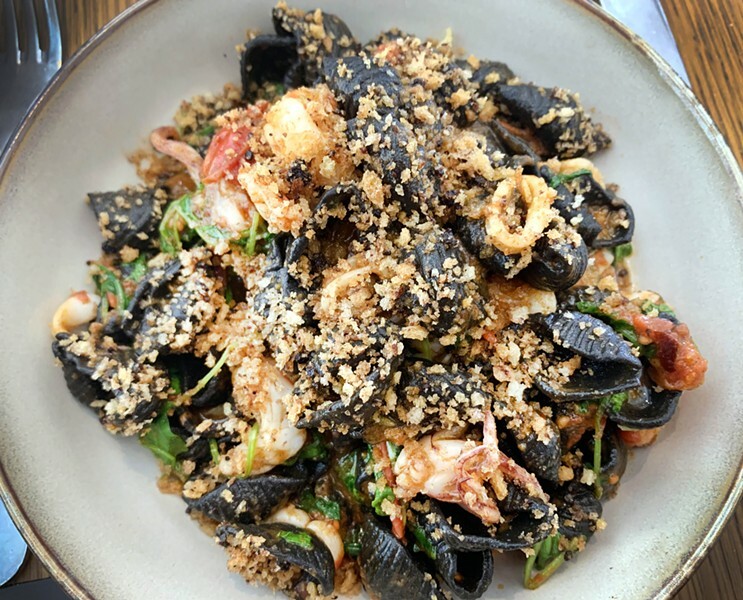 On one hand there's a dearth of high-quality Italian food in Detroit, so the nearly four-month-old restaurant at Grand River and Woodward avenues is a welcome addition. There are also few chefs in town of Andrew Carmellini's caliber — he's the recipient of multiple James Beard Awards, and won a Michelin star in 2006, while another of his restaurants received a Bib Gourmand in the 2015 Michelin Guide for New York City. Carmellini's skill is evident in San Morello's black shells puttanesca, a dish with big, sweet pink shrimp and small rings of tender calamari among a perfectly salty mix of shells, sweet cherry tomatoes, olive oil, garlic, chili, white wine, anchovy, arugula, and breadcrumbs with dehydrated olives, capers, and anchovy that provides a textural contrast. It's a plate to behold, especially in Detroit. But a restaurant's context, setting, philosophy, and values carry weight, and there's perhaps no more disappointing of a venue in downtown Detroit than the Shinola Hotel. Shinola is a polarizing brand that made its name on watches the company's former president, Jacques Panis, said come with "a story behind them." That story included a "Made In Detroit" claim and a suggestion of a longtime Detroit presence. But as I wrote in my 2016 piece "Adventures in authenticity at Shinola," the story is a lot of elaborate marketing. Most notably, Shinola isn't a Detroit company. It's owned by Texas-based watch mogul Tom Kartsotis's equity firm and only co-opted Detroit's story after commissioning a marketing study that determined consumers would pay a premium for a Detroit-made pen. Beyond that, the Federal Trade Commission slapped it for claiming its products are "Made in Detroit" when in fact it "assembles" foreign parts here. Given all that, it's a bummer that Carmellini landed in Shinola with his southern Italian concept. Especially because his tartufi pizza is one of Detroit's best pies — it arrives with a layer of umami-rich black truffles spread across a healthy blanket of creamy, salty fontina cheese and high-quality parmigiano. The crust bears leopard print char marks, and it's rare to find a pizza worth $28 for a 12-incher. Also exceptional is the swordfish milanese, which arrives with a large cut of fish encased in thick breading that's served aside a salad of mixed greens, bits of acidic fruit, and shallots. It's drenched in a powerful, flavorful lemon vinaigrette made with lemons that were charred on the wood-fire grill, then macerated with sugar and pureed with extra virgin olive oil. The menu's antipasti section holds about 10 options, and tuna crudo is among its best. The plate is composed of fresh, delicate tabs of big eye tuna made sweet and savory with chili oil, sea salt, and a Sicilian orange marmalade dressing with white balsamic vinegar and finishing oil. That's topped with Castelvetrano olives, small basil, and crispy farro, which provides a crunchy accent. Another winner is the creamy burrata served in a pool of lively, electric green arugula pesto and muffaletta flavored with white wine vinegar and Sicilian oregano. The smooth burrata is somewhat soothing among all the sharp, acidic flavors in the muffuletta and pesto. The warm green olives stuffed with almonds were pleasant, and the salumi of the day came with Laquerica prosciutto, which Carmellini says is a Midwest brand making salumi "close to Italian techniques and conditions." It also arrives with a house-made giardiniera, an excellent hunk of Grana Padano cheese, Calstevetrano olives and Calabrian chilis. The insalata misticanza is a heaping pile of sesame, radish, and greens that's topped with bits of crispy pepperoni. San Morello's menu also offers a "dips" section. The Italian butter bean dip with wild mushroom sott'aceto is a rather bland butter bean dip that's brought to life with intense pickled mushrooms. A sweet and savory choice is the sheep's milk ricotta with garlic and hot honey. Some co-diners and I tried a very similar dish at another downtown restaurant the week before and found San Morello did it better. The package of sea scallops with celeriac, fennel pollen, and winter citrus were the meal's low point, though that's relatively speaking. The celeriac and parsley overpowered everything, but separating the scallops remedied the issue. For dessert, the chocolate budino is the option to go to for anyone who loves chocolate, and the bar offers the quality that one would expect in such a restaurant's cocktail list. In general, San Morello seems to fit in with Shinola's high-end, contemporary vibe, but it doesn't pretend to be something it's not. So if you're able to swallow all that Shinola serves up, then San Morello is a welcome addition to Detroit.